Peelaway® 1 Paint & Varnish Remover is formulated to remove multiple layers of old toxic lead paint from ornate plaster ceilings and cornices, bricks, masonry, steel, cast iron and woodwork. Water based alkaline formulation. Works for up to 48hrs. Peelaway® 1 is water-based and most often used for restoration projects involving multi layers of oil based paints where the stripping compound is formulated to quickly react with the paint resins and convert any lead present into a compound that can be safely disposed of without endangering the environment. 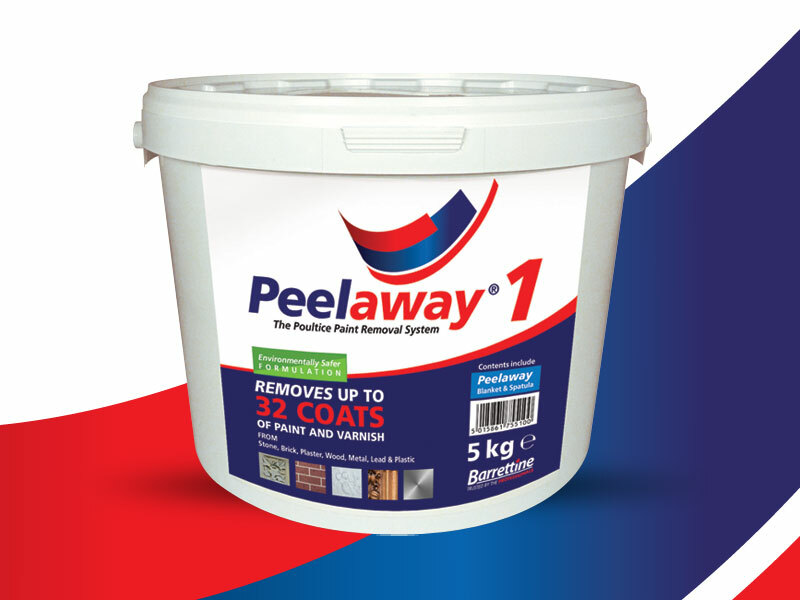 Peelaway 1® is a high pH product, so it can penetrate and react with the oil/lead content of multi layers of older coatings, this means that the stripped surface should be neutralised with a weak solution of acetic acid (supplied with the packs) and left to dry thoroughly before repainting. During very damp periods/conditions such as autumn through to spring, particularly on exterior substrates, moisture containing residues of Peelaway 1® may bleed out of the substrate at a later date thus raising the alkaline pH value once again. This could affect the repainted surface. As a precaution if Peelaway 1® is used and the surface is to be repainted, we would always recommend using a good quality alkaline resistant acrylic sealer/primer prior to repainting. However if the surface is not to be repainted, the pH or moisture content of the surface is not so critical. Peelaway 1®should not be used on gesso (a form of putty) mouldings sometimes used on apparently carved fireplace surrounds. Peelaway 1® should not be used to remove paint from veneers, plywoods, aluminium or unskimmed drywall and may discolour certain hardwoods. e.g Oak, Mahogany,Teak etc (use Peelaway® 7). P1 is mainly for lead and oil based paints and must be neutralised after stripping (pH between 5-9, fluid supplied). Moisture containing residues of Peelaway®1 may bleed out of the substrate at a later date thus raising the alkaline pH value once again. This could affect the appearance of the repainted surface. As a precaution if Peelaway®1 is used and the surface is to be repainted, we would always recommend using a good quality alkaline resistant acrylic sealer/primer prior to repainting. Repaint only when the surface has dried out (below 15% moisture) and has been rubbed down. Rubber gloves must be worn. Peelaway® will work slower under 5oC and will stop working under 0oC. You can apply Peelaway® with a spatula, trowel or brush; you can also spray it on for bigger surface areas. As a guide coverage is approximately 1m2 per kilo at 1mm thick for P7. For P1 the coverage is reduced by approximately 20 per cent. Always ensure that a sample patch is completed using the twin sample pots available. Starting from 1mm and building up the depth to 4-6mm on an area of 75mm x 75mm. If the initial tests are successful bigger test patches are advised before embarking on the whole project. This will identify the following: - which type of PEELAWAY® to use; - how much to put on; - how long to leave it on to do the job; - it will warn you of possible damage; - it will save you time and money; - and how successfully Peelaway will strip the particular surface.